Iowa Great Lakes Association President, Bill VanOrsdel, has announced Jen Johnson-Ross as the new Community Development Manager of the association dedicated to protecting, preserving and enhancing our lakes and environment. A Spirit Lake graduate, Johnson-Ross is a University of Iowa Graduate who possesses degrees in history and political science and certification as a secondary teacher. Upon graduation, Johnson-Ross was accepted into C.U.T.E. (Cooperative Teacher Education) and spent three years teaching ESL, GED as well as teaching high school history and middle school foreign language. 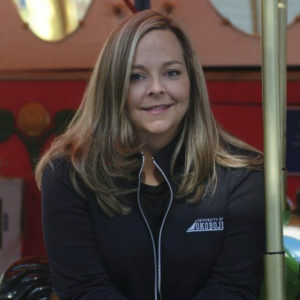 Johnson-Ross was also the Executive Director of Animal Haven, now known as the Great Plains SPCA, where she excelled at development, special event planning, public education and marketing to assist the 4,500+ animals in her care annually. Moving back to the lakes in 2008, Johnson-Ross became to program director at the Iowa Great Lakes Area Chamber of Commerce planning such community events as the University of Okoboji Winter Games and Walleye Weekend, as well as initiating the Boji Bike Rally, University of Okoboji Mutt Strut and the Iowa Great Lakes Fall Festival. Johnson-Ross was instrumental in obtaining new members for and the marketing of the chamber programs and initiatives. Johnson-Ross has served on the ISU Extension Council for Dickinson County, a 4-H volunteer instructor, director of both ArtsLIVE and Active Okoboji as well as a volunteer with IGLA, the Emmet County Animal Shelter and People for Pets.